Condition: Intact. it has functioned as a bar, cabaret venue, and hotel. Notes: Clontarf Castle is a much-modernised castle, dating to 1837, in Clontarf, Dublin, Ireland, an area famous as a key location of the Battle of Clontarf in 1014. There has been a castle on the site since 1172. In modern times, it has functioned as a bar, cabaret venue, and hotel. The Castle re-opened to the public as a four-star, 111-room hotel in June, 1997. The current building dates to 1837 and was designed by the Irish architect William Vitruvius Morrison for John Edward Venables Vernon, the then owner, when the previous building was found to be unsafe. 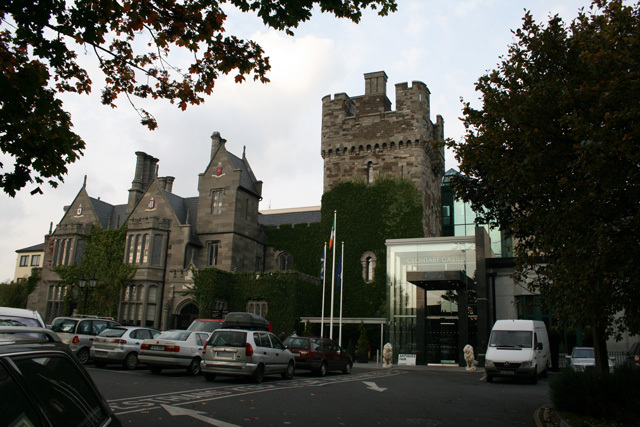 As the Clontarf Castle Hotel, it has been significantly enlarged by the addition of modern wings. Most of the former estate lands are long since sold for housing, but there remains a modest curtilage, with an ornamental gatehouse; most of this is laid out for car parking. Handel was a frequent visitor to the then castle during his stay in Dublin for the premiere of Messiah in 1742. The lady of the house at that time, Dorothy Vernon, was from Hanover and "particularly intimate" with the composer, who wrote a piece called Forest Music for her, said to combine German and Irish melodies. The neighbouring area of Dollymount is traditionally said to be named after this lady. Clontarf Castle was painted by J. M. W. Turner, although he never visited his patron Walter Fawkes was married to Maria Sophia Vernon of Clontarf and one of her sketches is believed to have been the basis of the finished watercolour. The work was mislabelled 'Caltarf Castle' and the subject was only positively identified in 1998 - it depicts the castle building previous to the present structure. Some childhood memories of the castle in the early years of the 20th century appear in Enemies of Promise by the writer Cyril Connolly, whose mother was one of the Vernon family. The castle is referred to by Phil Lynott of the Irish rock group Thin Lizzy in his song "The Friendly Ranger at Clontarf Castle", the opening track on their 1971 debut album Thin Lizzy. Before reopening as a hotel in 1997 the castle was for many years a popular cabaret venue; comedians Tom O'Connor and Maureen Potter and accordionist Dermot O'Brien have each released live recordings made there. Dana was crowned Queen of Cabaret there in 1968, prior to winning the 1970 Eurovision Song Contest. The 1997 building works included the construction of a new conference and banqueting centre which hosts conferences and product launches, a regular antiques fair, and is a popular wedding venue. In 2014 Clontarf Castle Hotel was awarded the 2014 Best Hotel Event Venue award at the 2014 Event Industry Awards.